[ Can you think of ways to help or advise King Trisong Detsen, so that his clothes won’t catch Fire? The real dharma king who owns the whole universe is incomparable to the king in the mundane world (who in this case only ruled over Tibet). Of course, these are two different ideas in the mind of the Guru and the king. 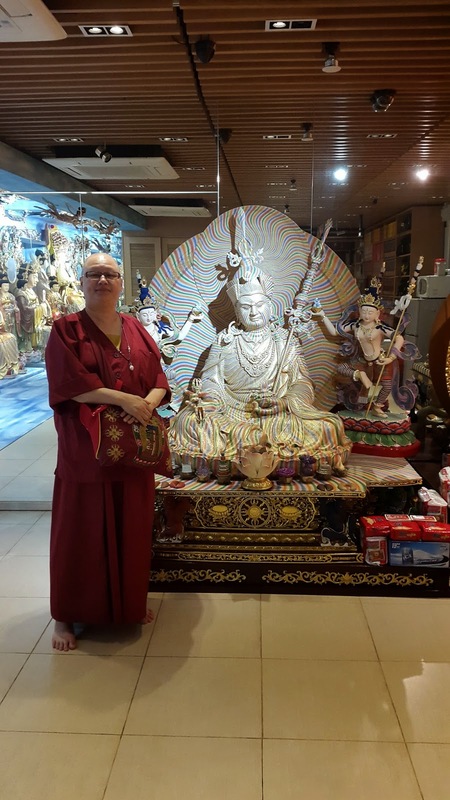 It is quite difficult to set aside the ego because the king thought he was well blessed with abundant resources, land, and concubines; and seeing Guru Rinpoche who came alone to Tibet without bringing any resources. 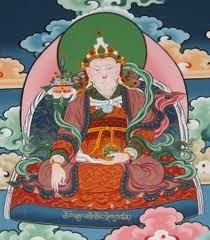 If he could set aside his title and status, bow down to Guru Rinpoche instead, I think his cloth won’t catch fire. Looking at the perspective of humility and respect, the one who is requesting the help and teaching should bow down sincerely to the one who is being requested (the teacher, in this case). Moreover, if the king would have understood the state of equality and realised some level of emptiness of worldly material, he would be okay. These throne, resources, and title are basically empty that they can’t be brought after one dies; but the teaching of the dharma is method that shall be carried along until reaching the perfect enlightenment, even after one dies. That’s why these intangible resources are far more precious than the tangible ones and if the king realised that, he should be the one who bowed down to the teacher instead. 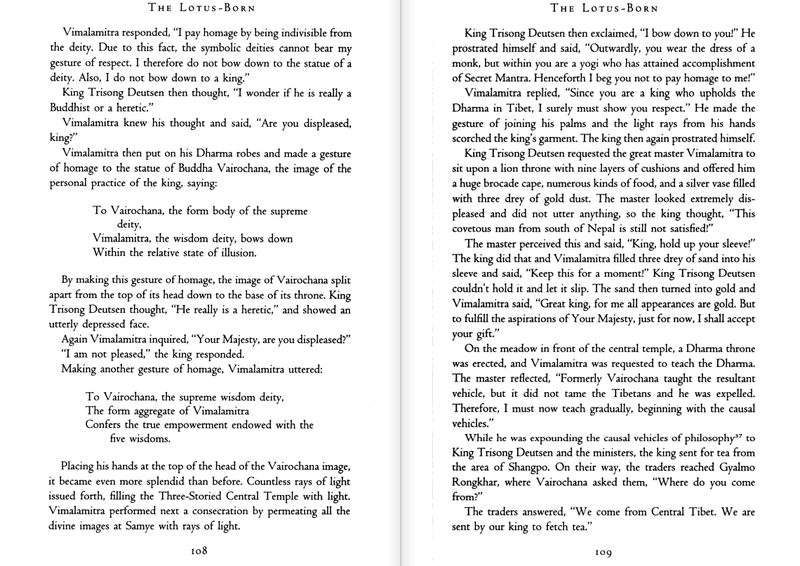 Some people, like the king, who thought that he could invite a great master to come and spread the dharma to Tibet, felt that he had a very great merit that surpassed every other being that he deserved veneration. Therefore, the king should have pondered beforehand, what he had accomplished in terms of dharma and salvation – because if he was the one who invited the master to come and teach, clearly it shows that the king had no knowledge of dharma whatsoever. Nevertheless the first meeting acted as a way to teach the king about pride, respect, and humility. 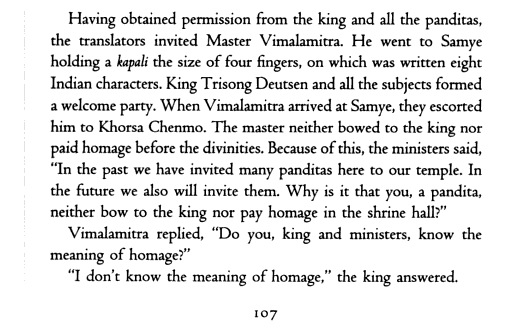 It happened again with Master Vimalamitra, and the king’s cloth once again caught fire, because the king didn’t understand the meaning of homage. I also attached the part 107-109, they have a very good explanation on the relationship of homage, form body and the wisdom body. However, you didn’t point your comments or answers to the Question at hand! For Enlightenment, you need to pinpoint only the Keys! Think on the Question and how to mould your comments accordingly. Cheers dear and have fun!